Yard waste is collected by the Town the 1st, 15th and 29th of the month. The Village of Alamance offers curbside collection of yard waste. This service is available during peak growing seasons and at Christmas for Christmas tree removal. Be sure to check the calendar each month to see the exact dates of pick-up. Bulk waste is picked up by the Town about every three months, however there is not a set schedule. 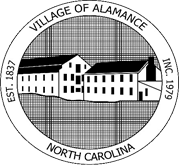 Contact the Village of Alamance to schedule a pickup.